If you have a lot of loose photos, old framed photos, or a lot of photo albums, it can be hard to know when you have duplicate photos because they are in so many different mediums. 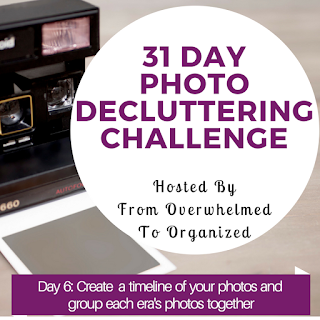 To help locate doubles and declutter your collection, make a timeline that reflects the time periods represented by your photos. This can include major events in your life, but should especially focus on different "eras" in your life. These are just ideas. You can incorporate any categories you want, based on your photos and your life situation. You can ask family members for help if you need to. Once you've established a broad timeline for your photos, use it as you're sorting your photos. You can make piles for each era or put each era's photos in a different box. Whatever works best. Depending on how many photos you have, this may take up quite a bit of space. After you sort all your photos into your broad categories you can further break each era down, especially if you have a lot of photos in any of your piles. If you have a lot of photos then you may want to pack up some of your piles and just work on one era at a time so it's not overwhelming. Make sure you label each pile or box so you can keep it all organized. 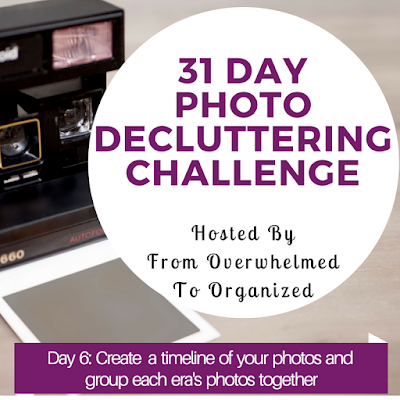 You can do a similar thing with your digital pictures but it's usually a little easier because you can sort them by date taken. But for scanned photos they usually are saved with the date you scan them so you may need to sort those photos by era yourself. 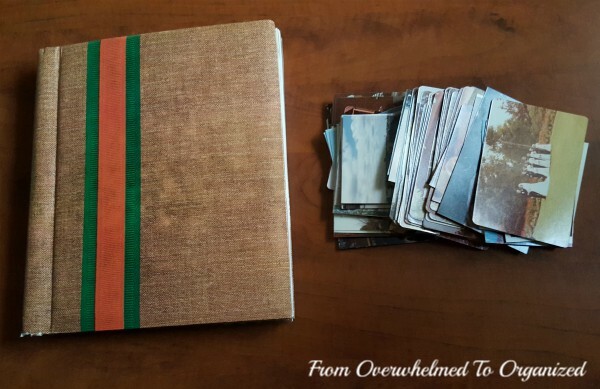 Whether you're sorting printed photos or digital photos, the key is gathering photos from similar eras together so you can see how much you have and identify if you have doubles or extra photos. I will get back to decluttering my digital pics soon, but I'm really enjoying going through my old photo albums. I went through one more album and decluttered 129 pictures, which was about 2/3 of the album. It was a little easier to let go of pictures in this album because I started getting into sets of pictures where there were multiple shots of an event and I could choose just the best ones to keep. Today's task is to create your timeline. Think through the various eras that are represented in your photos. If you gathered all your photos at the beginning of this challenge, then group them according to your timeline. Once you've grouped your photos by era, see if there are any obvious duplicates you can declutter. If you're planning to scan your pictures, keep the largest size printed photo to increase the quality of your scan.